Resources are a terrible thing to waste. As important community institutions, colleges and universities can serve as effective role models of how large organizations can reduce waste and conserve resources. Colleges and universities provide a training environment on effective recycling and waste reduction practices that can be implemented in other organizational settings. 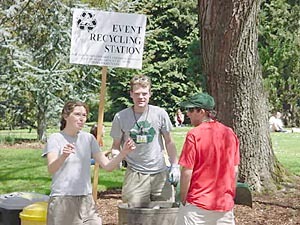 A large number of U.S. and Canadian college and universities have extensive recycling and waste reduction programs, some well over a decade old, and many of these are now examining how they can be transformed into completely sustainable institutions targeting Zero Waste as one of their long range goals. GRRN wants to help you achieve zero – Zero Waste, that is. The goal of this section of the GRRN website is to help students and other campus community members tap into the wealth of web-accessible information that is available on waste reduction and recycling. In these pages you will find an annotated listing of recycling and waste reduction web resources for colleges and universities, opportunities to take action in waste reduction campaigns, and, finally, a review of useful web resources for creating sustainable or “green” campuses. Note: the What’s Hot areas in red denote what is particularly useful at the links sited. Also: It would have been very easy to include considerably more links to other excellent sites in this Campus Zero Waste subsite. This is a only starting point. If a site you think is excellent isn’t here, you’re probably right! Because there are so many sites, we chose a small list that not only reflects the wide variety of resources available but also links admirably to the greater set of available resources on the net. Our links database is growing daily. This is an archived site. Very little will change for now. This website is a project of GrassRoots Recycling Network. If your university or college has a Zero Waste policy, let us know. If your school's program fits into one or more of these pages, we would love to include it here. GRRN's 'Campus Zero Waste' Project contains links and descriptions originally compiled by Roger Guttentag, who writes the Recycling in Cyberspace Column for the monthly periodical Resource Recycling. Campus Zero Waste is a project of GrassRoots Recylcling Network.